Milk maids are a ubiquitous sight in the spring, with their flowers of four simple white petals alternating sparsely up a stalk. They are one of the first of the year to start blooming, and they can last through May. Wikipedia says the name derives from a hat often worn by milkmaids, but that seems like a stretch since there is nothing bonnet-like about these blooms. 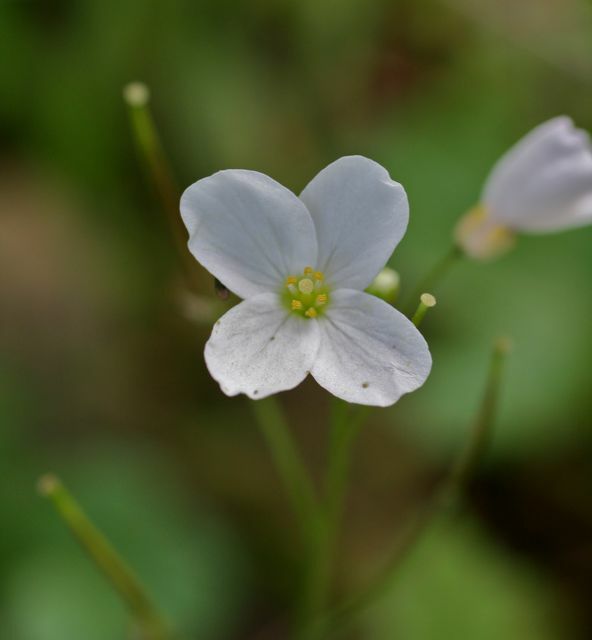 Cardamine californica has flowers that are about half an inch across, and grow in most habitat types in the county except the driest. The four petals mark it as a brassica, the same family that houses wild mustard and radish. Many cultivated edibles, like broccoli and kale, are also in the Brassicaceae. Because of the “cross shaped” petals, this family once was called the cruciferae. This pretty little flower is one of the earliest to bloom, and all parts of the plant (leaves, flowers, and roots) are edible, with a peppery radishlike flavor–they are tastiest before the flowers bloom, according to Judith Larner Lowry’s wonderful book, California Foraging (I admit I haven’t done a careful comparison myself).